When Toyota launched the Corolla Hybrid onto the Japanese market a few weeks ago, they discreetly pointed out to me that “unlike what we usually do,” this is simply marketed as an engine package, not as a separate model. Some may think this is because there is no shortage of separate Toyota models on the Japanese market. I see it as a step towards Toyota’s mainstreamification of the hybrid powertrain. 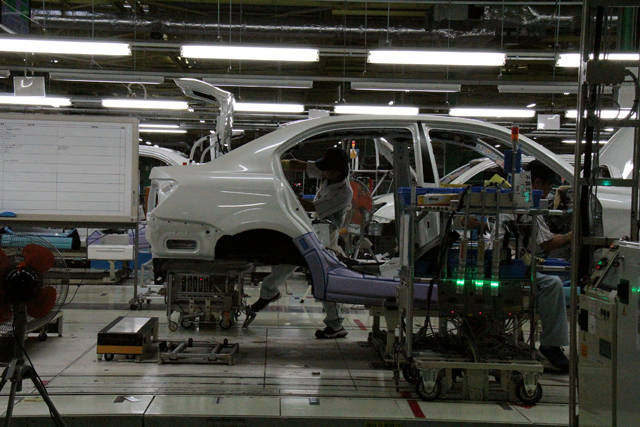 On Friday, I went to Toyota’s plant in Ohira, Miyagi, to see the first Corolla Hybrid come off line. Until Toyota came to town, Ohira’s only claim to fame was that it is the only independent village in all of Miyagi prefecture, everything else is either towns or cities. Everything in Ohira is small, including its Mayor. 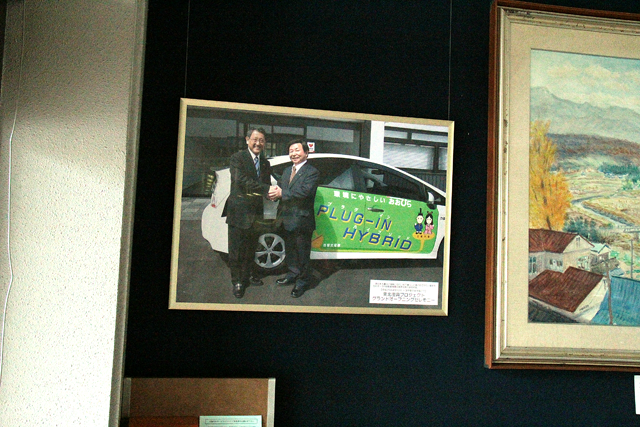 Also in the town hall is a photograph where Toyota’s president Akio Toyoda hands over the keys of a Prius plug-in hybrid to His Honor. Akio is no giant, but he clearly towers over Mayor Atobe Masahiro. Ohira lies some 16 miles and $130 for the taxi driver (do NOT believe that the yen is undervalued) from Sendai. The plant had an ominous start. Four weeks after it was opened in February 2011, Sendai and much of the Tohoku coast was hit by the March 11 earthquake and tsunami. The plant itself is built well and was relatively unscathed. Nonetheless, it had to stop production. First, because no gas was flowing. The gas was needed to dry the paint. Then, the plant shut down with all the other Toyota facilities while waiting for a resumption of parts deliveries. Also near Sendai is the Naka plant of Renesas. It did not fare as well as the Ohira factory. Renesas is one of the world’s leading manufacturers of flashable microcontrollers, the little brains that are inside of more products than we imagine. Renesas supplied some 20 percent of the world’s automotive microcontroller market. About 70 percent of the production was sold to Japanese automakers, the remaining 30 percent went to US and European car companies. The plant looked like it was hit by several bombs. It looked like it would not ship chips before the end of the year. Four weeks later, and with the help of thousands of people brought in from all over Japan, the plant was working again. The battery/ Small enough to fit under the rear seat. This is not forgotten, but not on top of the mind anymore this Friday in Ohira. Today is the day hybrid technology comes to town. Hybrids are a big hit in Japan. Toyota’s Prius has been on top of Japan’s sales charts since 2009. It recently has been toppled by its Aqua sibling, which is sold in the U,.S. 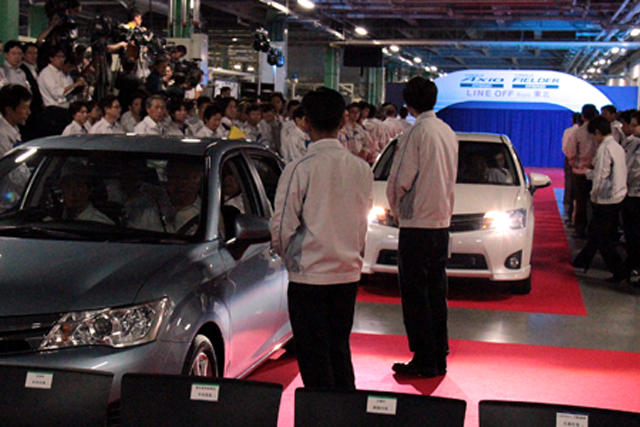 as the Prius c. When the plant opened two years ago, reporters wanted to know when hybrids come to Ohira. Finally, it has arrived. In the plant itself, very little had to change to accommodate the new technology. The plant is a flexibility marvel. A regular car factory usually has below ground pits for the motors, chains and gears that keep the line moving. In Ohira, the cars move on maybe a foot high conveyor system that is simply bolted into the concrete flooring. Cheaper to build, cheaper to tear down and rebuild somewhere else. The line can be lengthened or shortened at will. 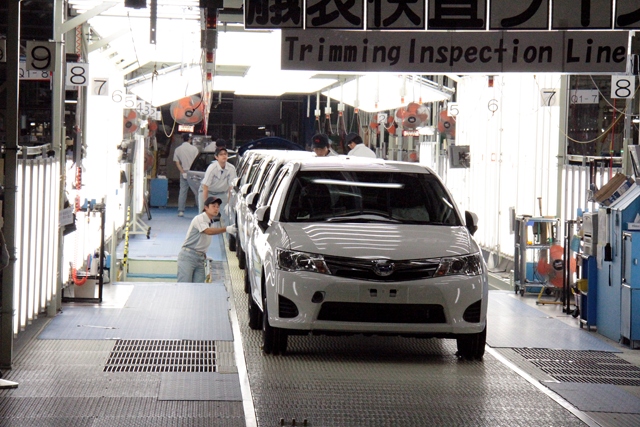 The assembly line doesn’t “grow roots” as they say in Toyota-speak. The cars no longer dangle from the ceiling while parts are attached from below. They roll on a simple raised platform. This reduces the ceiling height of the factory. Advantage: 50 percent of the investment saved, says Toyota. A side effect of the non-dangling is that people can work on a stationary object, instead on one that dangles. Usually, cars move along an assembly line in a vertical line, as if they already are sitting in a slow-moving traffic jam. Not in Ohira. Here, the cars move sideways. Think of a parking lot down at the mall. Now move the parking lot to the right. Advantage: With the cars moving sideways instead of straight ahead, the line can be 35 percent shorter. The factory can be smaller. The expenses are lower. The paint spray line of a car factory usually is a highly complex system that is built in place. Very expensive parts and experts have to be flown in. Not in Ohira. For Ohira, Toyota developed a modular paint spray line. The modules can be built somewhere else and are assembled at the plant in a much shorter time. Advantage: Cost savings. The Ohira plant is a secretive plant. “No photo! 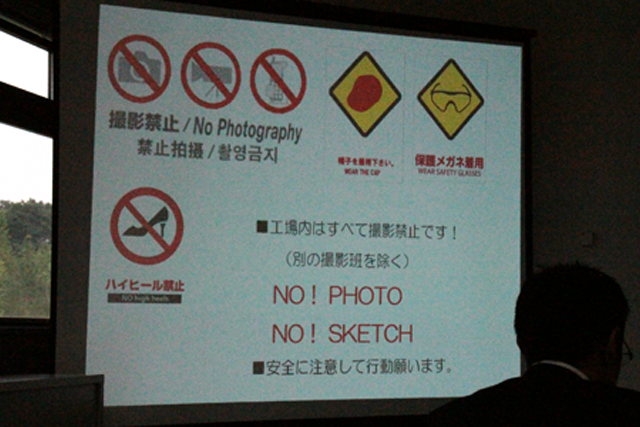 No sketch!” warns a slide. The ubiquitous camera-equipped smartphones get a little sticker to cover the camera. Photo-ops are limited to three stations, and reprimands are handed out if the camera points in the wrong direction. While never officially confirmed, it is widely understood that Ohira is a pilot plant where production technology is developed and confirmed before it is rolled out all over the world. Toyota’s global bestseller, the Corolla, is not very important in Japan. On the January through July Japanese sales chart, the Corolla sits in rank 8. However, it is THE strategic model for Toyota’s continued growth and its further expansion into the world’s emerging markets. The Corollas that are made in Ohira are not for export. The export article is the production technology developed for and in Ohira. Hybrid technology may top the charts in Japan, in the rest of the world, it definitely does not. The market share of all hybrid cars sits in the 3 percent range in the U.S. In diesel-enamored Europe, the market share of hybrid vehicles remains below the detection threshold in most countries. 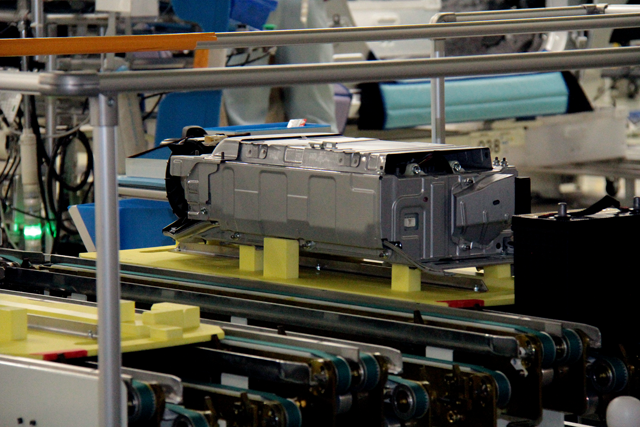 In China and the world’s emerging markets, hybrids play even less of a role. This is beginning to change. Experts agree that Europe’s ambitious emission goals need hybrid technology to be met. China is dropping its fruitless fixation on EVs and is moving towards hybrid. Toyota’s internal goal is that hybrid powertrains are mainstream by the end of the decade: Small enough in price to be affordable. Small in package size to fit in most cars. Big in savings. The hybrid-engined Corolla is very close to all that. It may only be meant for the Japanese market. But like so often in Ohira, it is also proof of the concept that a hybrid powertrain can be fitted to just about any car the world over. This entry was posted in Corolla, Japan Earthquake & Tsunami 2011 aftermath, Toyota and tagged Bertel Schmitt, Corolla, Hybrid, Ohira, Toyota by Bertel Schmitt. Bookmark the permalink.